Suitable for small and medium sized packaging for single lane applications at speeds up to 60m/min. X34 X-ray Inspection System is a single lane solution designed for the inspection of small and medium-sized packaged products. Designed for small,medium & large sized packaging for single and multi-lane applications at speeds up to 80m/min. X-ray inspection systems for packaged products offer maximum contamination detection sensitivity at high throughputs for a diverse range of food and pharmaceutical applications in various types of retail packaging. Typical packaged applications include foil and plastic containers, cartons/boxes, foil pouches, bags and sacks, trays, tubes, sachets, flow-wraps, PET bottles and blister packs. X-ray systems for packaged product inspection deliver outstanding contamination detection of dense contaminants such as glass, metal, mineral stone, calcified bone and high density plastics irrespective of their size, shape or location within the products itself, even in foil or metallised film packaging. Unlike traditional inspection systems, the x-ray technology is not affected by changes in product temperature or moisture, ensuring minimum false rejects. Safeline X-ray inspection equipment simultaneously enhances productivity by inspecting products for a range of quality control checks. These include measuring gross and zoned mass, counting components, identifying missing or broken products, monitoring overall and zoned fill levels for portion control to protect profitability, detecting product trapped within the seal and checking for damaged products and packaging for complete product integrity. Safeline provides the most advanced x-ray inspection capabilities on the market for packaged food and pharmaceutical products. Energy efficient and adaptable solutions with a range of power options are available. Some models do not require a cooling system due to low power consumption contributing to a reduced Total Cost of Ownership (TCO) for customers, making it a future-proof investment. Safeline offers a wide range of x-ray inspection equipment to provide product safety, integrity checks and quality assurance for food and pharmaceutical packaged products. By ensuring products look and perform exactly as consumers expect, x-ray machines offer a cost-effective, quality control solution for manufacturers and retailers to avoid safety scares, product recalls, negative press and customer complaints. How can a manufacturer prove an x-ray system is an effective quality control solution? X-ray inspection machines inspect every single item on a manufacturing line: they detect and remove non-conforming product containing foreign body contaminants and product defects plus inspect for presentation defects for example, mass, missing components etc. The monitoring technology records and collects all inspection results for due diligence and legislation requirements. In addition, advanced software can provide pre-warnings of the accuracy of the x-ray laser and reject mechanisms to ensure that the technology is fully optimised to work at high precision levels. How is production line uptime ensured? Depending on the individual application, x-ray technology can conduct, integrity checks up to 1,800 pieces a minute. Safeline’s intelligent set-up software is pre-programmed to accommodate the inspection of specific products and packaging thereby reducing manual operator installation time. This capability gives manufacturers the flexibility to switch product or packaging type with minimum downtime. How does an x-ray system complement a clean-room or harsh wash down environment? 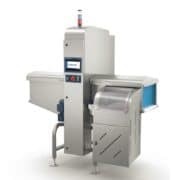 All x-ray inspection systems are designed to industry recognised hygienic guidelines such as the European Hygienic Engineering and Design Group (EHEDG) and National Sanitation Foundation (NSF). Anti-corrosion materials and IP69 ingress protection rated x-ray systems are available to complement sterile environments or harsh wash down schedules to prevent bacterial contamination. How can an x-ray system safely remove a packaged product? Once the x-ray inspection system has recognised that the packaged product is non-conforming it securely removes it from the production line by a reject mechanism into a rework bin. Different reject devices are available to suit the nature of the product for example, reject nozzles using jets of air are suitable for small light items whilst reject flaps or pushers precisely remove individual large or heavy packages. Manufacturing lines can also have a combination of different reject mechanisms and rework bins. Where is the best location for optimal inspection of packaged products? At entry point on receipt of the raw product – verifies supplier contracts as the x-ray system assesses the quality of the original product; protects bottom line savings as it enables early reworking of any substandard product; avoids damage to production equipment further down the line by large or solid contaminants. During the production process – saves time and money as rejected product can then be reworked without further goods being added; protects brand integrity by ensuring the packaged product is as advertised i.e. no missing components, is at the correct fill level and mass etc. End of the line after the packaged product is sealed before dispatch – safeguards the manufacturer’s reputation as, if needed, they can provide documented evidence that they have reached the highest levels of product safety and quality control before the packaged product leaves their facility; upholds brand integrity; protects the consumer against substandard products. Regulatory compliance is necessary for manufacturers and retailers to export their packaged products into different markets. Al Thika Packaging is the main distributor of Mettler Toledo in Middle East. Since 1994 Al Thika has been supplying a wide range of machinery including Garvens dynamic Checkweighing systems, Safeline X-ray inspection, Safeline integrated metal detection systems and CI-Vision inspection systems in Dubai, Abu Dhabi, Sharjah, Fujairah, Ras Al Khaimah, Ajman, Umm Al Quwain, Al Ain – UAE, Saudi Arabia, Bahrain, Oman and the many other Gulf countries..